What a beautiful weekend for Pride in Atlanta, and this morning feels the most perfect of all. Getting ready for the parade today, I was reminded of a moment from last year. After the long, stretched-out parade ends, the spectators fill in behind the last float and follow it down the parade route to Piedmont Park. 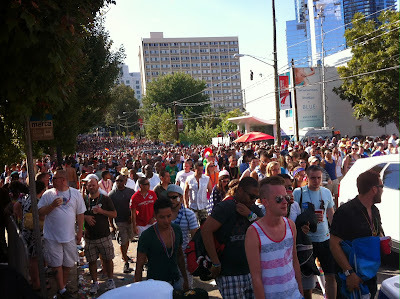 This is when the truly massive scale of Atlanta's Pride attendance becomes evident. Pride brings in people from hundreds of miles of the surrounding South. I forget what an incredible island of tolerance I live in and how different gay life is once you drive just a few miles outside of Atlanta. I watched the parade next a couple of young women from North Georgia. I'm guessing they were about 18 or 19 years old and they told us how much they were really enjoying their visit to Atlanta for Pride. When the parade ended, we watched the throng of spectators walk past and waited for an opening to join in. There were hundreds of thousands of happy people walking down Tenth Street. One of our new friends turned to me and said something I can't forget: "This many people can't all be wrong." "What?" I asked. I noticed there were suddenly tears in her eyes as she added, "I mean, God wouldn't send this many people to hell, would he?" I flashed back to a time long ago when those exact kind of questions weighed heavily on my mind. In that moment my empathy kicked into high gear. I knew exactly what she was feeling and which pieces of her life-long baggage she was beginning to consider tossing overboard. And all I could do was hug her. "No He wouldn't," I whispered in her ear. "There's no way."